Okay, so here is my first collection photo-update. I apologize in advance for the mess of some of my shelves (and my floor!) as I am running out of display space faster than you can even imagine. I tried to neaten up a couple of the shelves as best as I could, but some shelves I am just downright refusing to show at the moment! 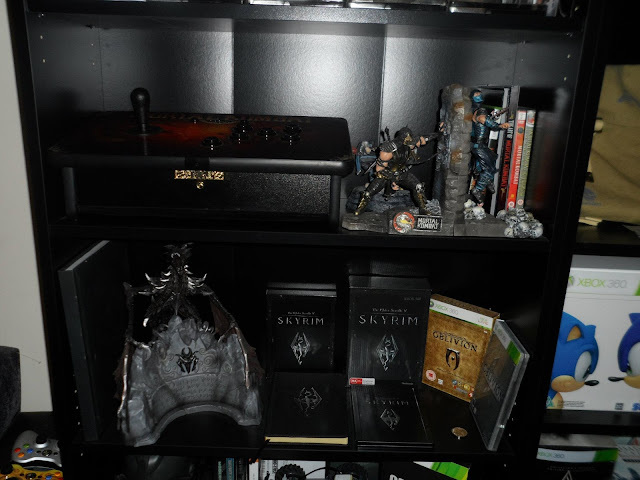 So here it is, my collection! 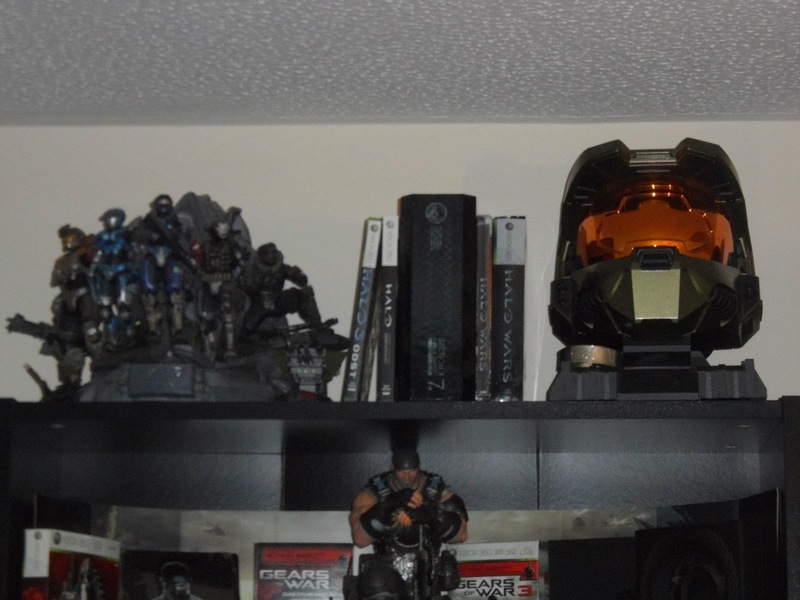 Okay, so there is my Halo shelf. Right at the top. On it, you can see my Halo Reach Legendary Edition statue, a few Halo Mega Bloks figures, a signed copy of Halo ODST, slipcover copy of Halo Combat Evolved Anniversary, the Limited Edition part of of the Halo Reach Legendary Edition, a promo Halo Wars steelbook, the Halo Wars Limited Edition, and of course my Halo 3 Legendary Edition. Wow. That was a lot of words in one sentence! Ahh, my Gears of War and Batman shelves. So pretty :) Okay, on the top shelf, there is my Gears of War 2 Limited Collector's Edition - which is in okay condition considering it's age, (and the fact that Allan owned it prior to collecting!) but definitely in need of replacing. 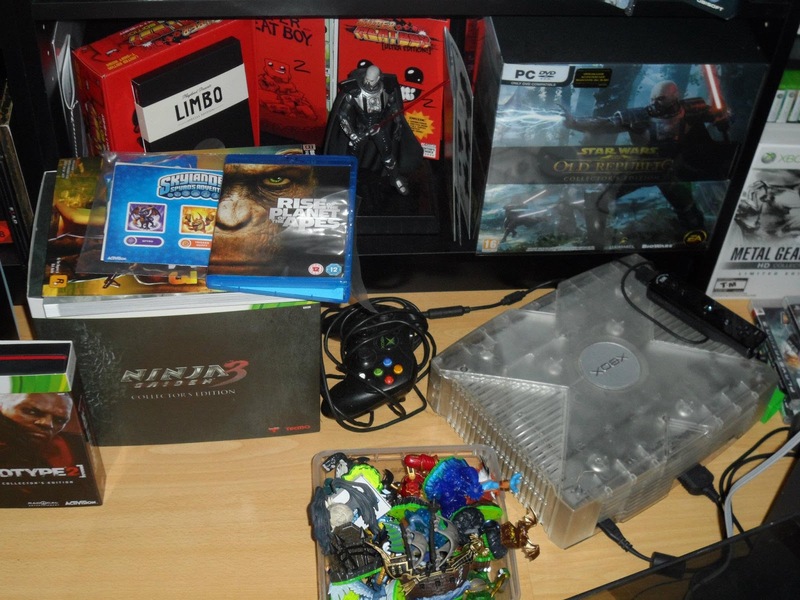 Next to that is the Gears of War 3 Futureshop Midnight Launch steelbook, alongside a GOW Curb Stomp First Aid Kit preorder bonus, then my Marcus Fenix statue from the Epic Edition of GOW3, another preorder bonus, this time a GOW3 Beanie Hat, lastly followed by two things that are VERY difficult to see in the crappy lighting: the artbook from the Epic Edition, as well as the Limited Edition contents that were also included in the Epic Ed. Next up is a lovely attempt at showing my clearly fantastic photography skills (LOL). I'm tired, okay!? 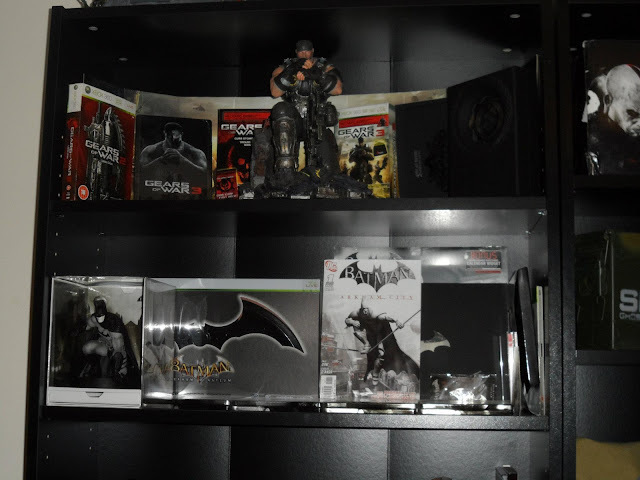 Top shelf is Mortal Kombat based, and includes the Mortal Kombat Tournament Edition, UK Kollector's Edition, US Kollector's Edition, aswell as the Futureshop exclusive steelbook (G2) and the Mortal Kombat movies. 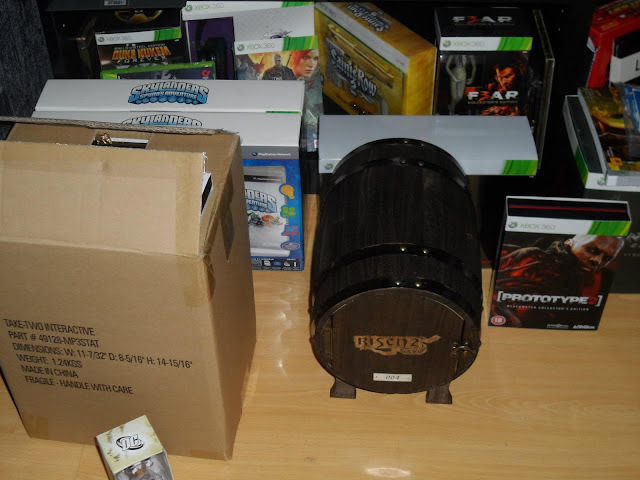 To all you eagle eyed people who can see a coin in front of those, it is not the coin from the Oblivion CE (that coin is still in the box), it is actually a replica prop coin from Xmen First Class. I have no idea why it's actually on that shelf to be honest! 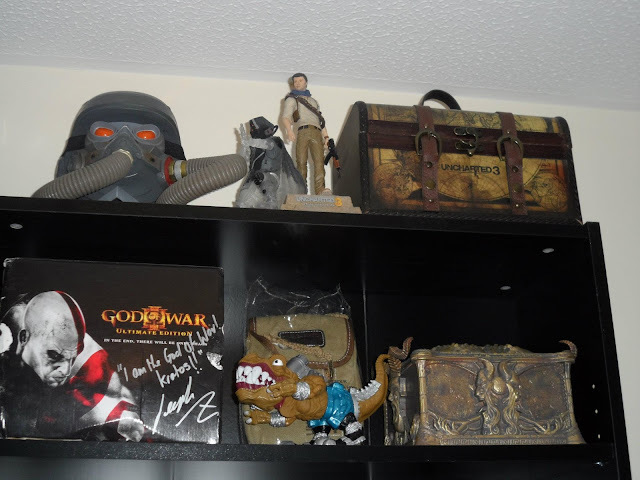 Shelf below, you can see my signed God of War III Ultimate Edition box, aswell as the Pandora's Box to the far right which was included in that edition. In the centre, is a rather odd fellow. I have no idea what it is, other than the fact that Allan and I stumbled across it at a car boot sale and he HAD to have it as he had one when he was little. It's reasoning for being on the shelf? To keep it out of reach of AJ. 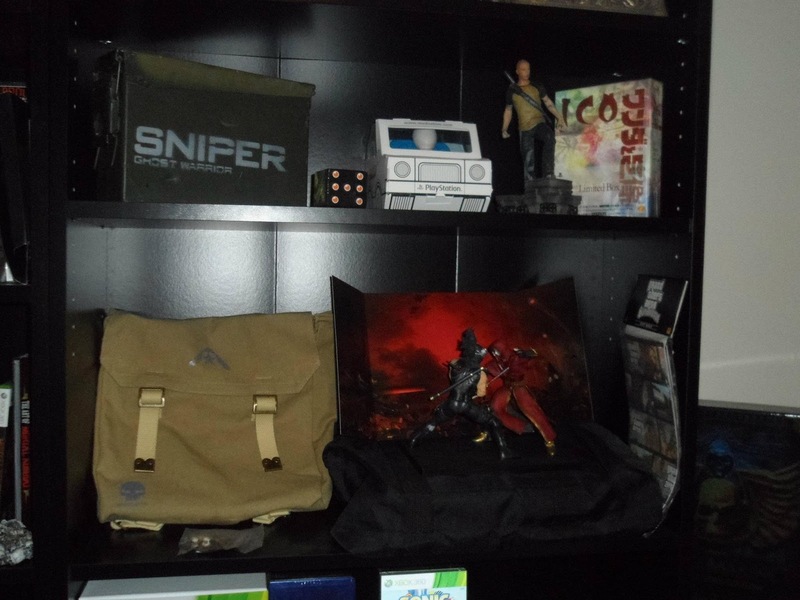 And behind that you will see my Uncharted 3 bag (and behind that is my signed Dead Rising Servbot mug, which will be getting displayed proudly as soon as I get more shelves!). Y'know what guys? I am shattered. So I'm actually going to head off to bed now, and will continue this update tomorrow. Anyway, the collection is growing at a rate of noughts and it's getting hard to keep it under control. 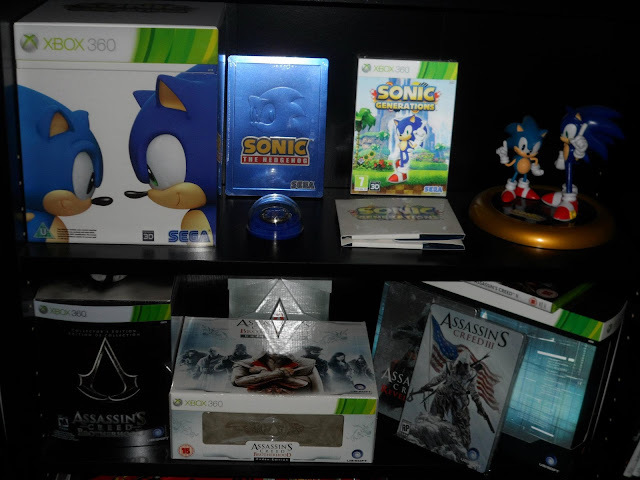 I no longer have enough space on shelves to accommodate particular games/franchises and have them together. 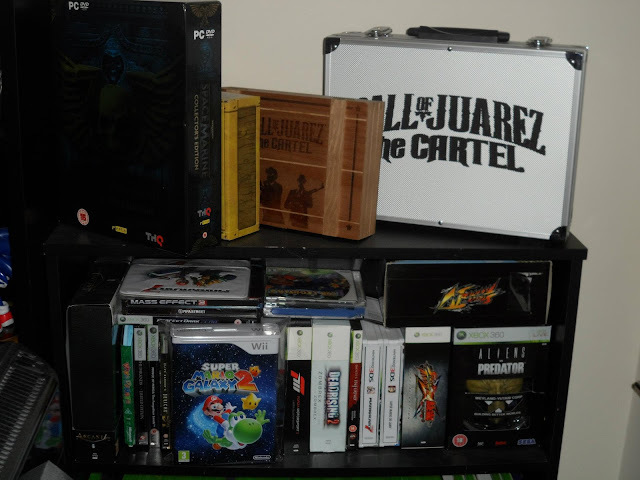 I also no longer have enough shelves to accommodate all of the different games I own! But oh well, I'll just have to buy more shelves soon then, won't I? Especially since I had a look through everything I've got preordered over the next few months, and it's coming to a total of £1650 (approx). 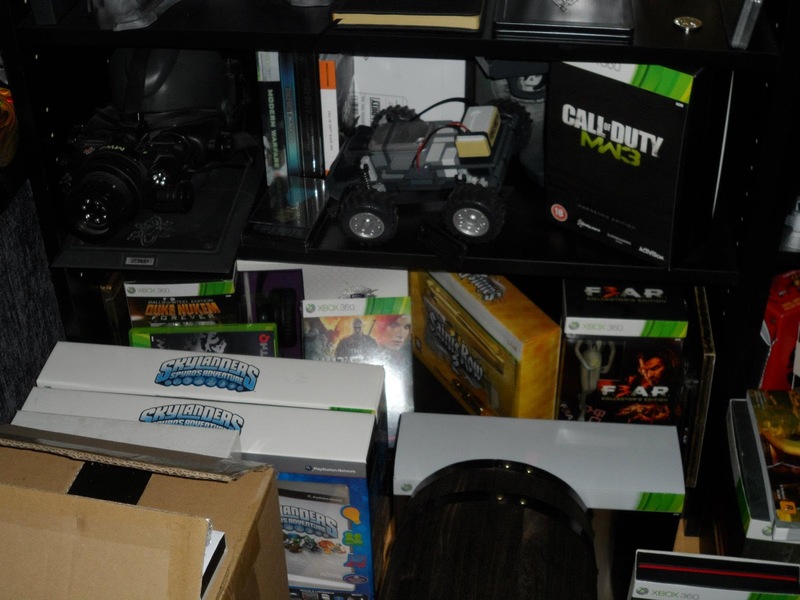 And that's not even including the CEs/games/movies that have yet to be announced/made available for preorder. EEK! So, check back in an hour or so for the photo update :)! I've just had a quick glance at the hits bar, and since this site started (less than a month ago) I've almost had 500 hits! Hopefully the hit counter will skyrocket once I start actually getting the updates rolling on a regular basis and have new photos and videos to show regularly. Microsoft points were half price today at GAME (well, the 400 MSP bundles were anyway), so with the Reward points I had left on my GAME Reward card, managed to snag 1600 MSP for FREE! 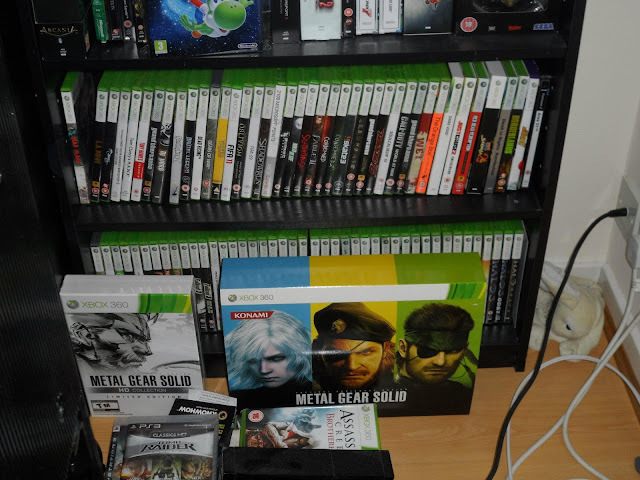 Probably going to do a review of one of the editions in my collection tonight aswell, if time (and my son) allows! This is the first movie I have gone to see in the D-Box seats, and my God! They do not disappoint. Every twist and turn, you twist and turn with it. Every gunshot that is fired, you feel it. Every whir of the helicopter's blades, you feel - as if you are standing right there with it. And explosions, wow, you don't just get thrown back in your seat, the seat jolts you around in all directions, much as a real explosion would do. Simply amazing. Although, now I fear that because I have used the seats once, I will want to be in them every time I visit the cinema, which, between me and Allan - is an extra tenner a time! Anyway, onto the movie. It has everything you could possibly want in a superhero movie. An awesome cast, a badass enemy, an amazing mix of tension and chemistry between the main cast, a superb bunch of background characters and extraordinary fight/action scenes. The entire movie left me sitting with my mouth open, in awe of it's brilliance. And there were a few extremely funny moments, that left myself and the entire audience howling with laughter, and giving a round of applause. All of the main cast get their fair share of screen time (except for one), and they really make the most of it. 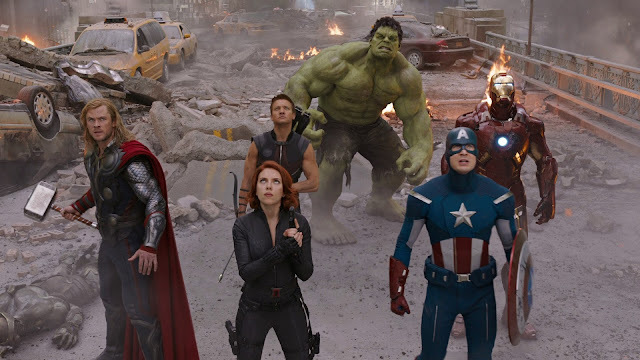 Natasha Romanoff, aka Black Widow (Scarlett Johansson) is a much more substantial character in this than what she was in Iron Man 2, and despite the fact that most people just assume that she is only in the movie to give it some sexiness (considering it's a highly male dominated cast, and movie), they're wrong. 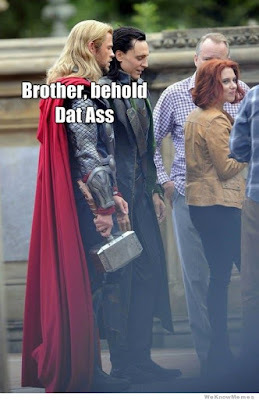 She does of course give it some eye candy, but she is also a very prominent part of the Avengers team. Bruce Banner, aka The Hulk (Mark Ruffalo) was a highly talked about addition to the movie prior to release. Everyone worried that he wasn't up to the part. After all, what has Mark Ruffalo really been in, other than Rom-Coms? That was all that he was really associated with. Obviously he'll have been in other things, but Rom-Coms are what stick out most for him in our minds. Well, not now. I love Ed Norton, and found him to be a fantastic Banner/Hulk, but my God, Ruffalo has definitely outshone him. He is just everything you could want in Bruce Banner, and even more of what you'd want in Hulk. Quite simply, outstanding. Tony Stark, aka Iron Man (Robert Downey Jr.) was amazing in this movie aswell, his usual stuck up, selfish self, and oh so funny. He has a few great one liners, and I love the tension between him and the other heroes to begin with, as they are all strong, confident characters so it is obvious they were going to clash at some point. He was actually my favourite to begin with, but then Hulk stole that from him! He is still my second favourite though. 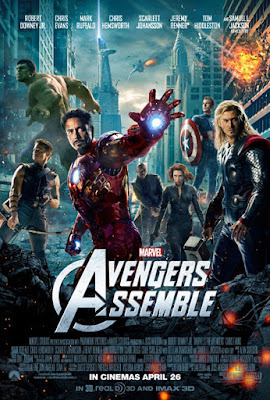 Thor (Chris Hemsworth) and Captain America (Chris Evans) were also fantastic in this movie, but I feel that I have kinda let their characters down, as I have still yet to see their respective movie titles. So I feel like I went into the movie, not really knowing who they were, and came out knowing a bit, but there's knowledge missing. So I am definitely going to buy both of their movies on BluRay in the next few weeks, just so I don't feel as though I've missed out! And last but not least, Clint Barton, aka Hawkeye (Jeremy Renner) was great in this movie, but I feel like he didn't get nearly enough screentime compared to the other characters.You briefly see him around at the start of the movie, and then bar a few small shots of him, you don't really see him again until the end. He was, no doubt, an amazing character - but he definitely did not get the screentime he deserved. I am hoping that if and when Avengers 2 is released, he comes back for that, and gets his fair share of action. Overall, it is an amazing movie, and has bumped The Dark Knight off of my number 1 spot for favourite movie (sorry Christopher Nolan!) 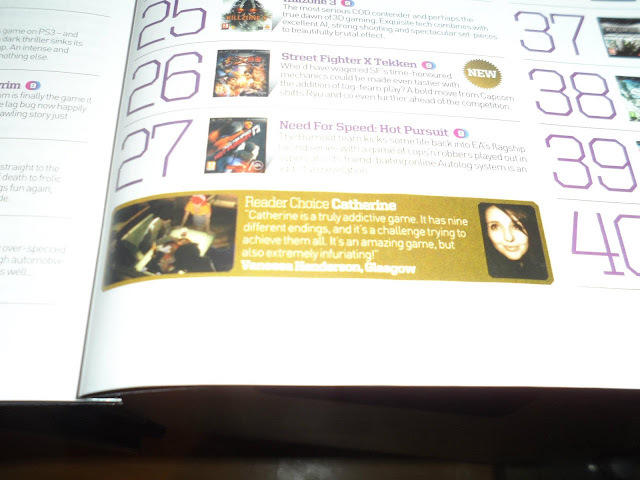 and it is definitely one I'd urge you all to see. The characters, the story, the action, and the two absolutely hilarious (but unexpected) moments from The Hulk all just combine to make a movie that I cannot wait to see again. I'm gonna give it a 9.5/10, it would have been a 10, but I feel that Hawkeye's lack of scenes kinda took away from it a little, but overall still a brilliant must-see movie. Let me know how you feel about the movie in the comments below! I know, I know. Such a cliché title. But, I had to. Definitely going to have images of my collection up over the next few days (will probably have to upload in batches, since there is far too much) and will do a review on The Avengers (I refuse to call it Avengers Assemble any longer) today. I hope you can all accept my apologies when I say that I'm sorry for not updating this very often. Things have gotten quite hectic over here the past few days, but I guarantee I will update as often as I can. I'm aiming for at least one post a day, be it that a general post such as this, or a review, or even an update into my collection. That is just my easy target though. Ideally I will get a few posts done per day: a couple of general ones, a review or two and a small update on the collection.